Great pick, Tom. Working on this week's piece taught me that Zoidberg, my favorite character on the show, would be a hideous freaking monster in real life. the business! love it, absolutely. hedonism-bot, morbo, the hypno-toad: you hit all my favourites! The brains, the finglonger, hedonism-bot, robot-devil; you got so much in there man. Great colours too. this week has been an amaizing one from Comic Twartists! Beautiful stuff (As per usual). Strangely, it makes me long for a "Professor Farnsworth meets Doctor Savanah" team-up. Hypno-toad vs. Mr. Mind would also be good. Love it, especially the shading and the perspective. All that's missing is Brannigan. WOW. 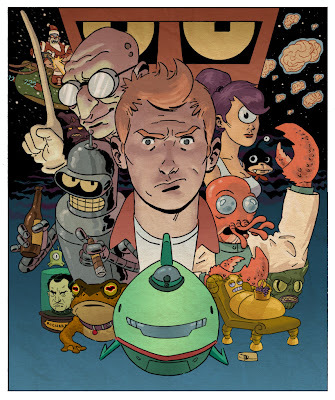 This really is Tops man, your design sense is just inspiring... it has this vintage psuedo throwback sci-fi vibe to it... & the rendition of Fry really makes me feel like we can see these oddball creatures & occurrences from his perspective! KUDOS!